The following email was sent to OxVox members on 6 January. Firstly may we wish you a belated Merry Christmas and a happy new year from all of the committee of OxVox. Here’s hoping 2019 proves more successful on the pitch and we receive some much needed cheer in January. Given the speed of recent events it was important for us to discuss these issues fully and make the right decisions to take OxVox forward and to make sure we continue the hard work that has already been done and make further progress on all fronts. What we can assure you of is that OxVox has not been sitting on its hands over the Christmas period. It was important for us as a committee make sure we continued to press Tiger and the board for answers to questions regarding the board and the HMRC issue so with the approval of the committee we took the opportunity to speak to both Tiger and Niall McWilliams on the phone. Both were happy to take our calls and we arranged a meeting for 11am before the Bristol Rovers game. Much has been written about the questions left unanswered by Tiger and the board but we felt a face to face meeting would be more productive in getting more information. We went to the meeting with a short list of questions that we told Tiger we needed answers to and both he and Niall understood the situation and said they would tell us everything they could. While some of what was said was in confidence we have listed the questions below and put together the answers from various parts of what was a wide ranging and open discussion. At the meeting were myself (Paul Peros) and Ali Wolfe from OxVox and Tiger and Niall McWilliams (Niall was present for most of the questions but was forced to leave to attend to match day commitments later on). We now know the HMRC is fully paid but can you explain in further detail what led to the failure to pay and what has been done to make sure this never happens again? Tiger explained that the problem was caused because of a number of unexpected expenses arriving at the same time forcing them to bring money in from abroad. While he suggested finding the money was not an issue, moving it into the UK was (It is our understanding that this is the case and that it has become harder over the last few years to move money for certain regions). We asked what the expenses were and what made them unaccounted for. They suggested that the issue was now in the hands of solicitors so they needed to remain confidential for legal reasons. We were given some details as to what had come about and agreed that as a legal matter we would not pass them on. Without making any comment about how they came about or whether this issue could have been better dealt with and at an earlier stage, we can say that these expenses are extraordinary and should, in time, be of benefit to the club moving forward. We also accepted that given the timeframe, that bringing money in to the UK would have been problematical but we stressed that we felt provision must be made to prevent this happening in the future and that the club could have dealt with this situation better in the first place. To what extent and in what areas of the club will the new directors be involved? Is Erick an active member of the board now or will his participation be merely advisory? Tiger confirmed that Erick was indeed a full director and that they were in contact regularly, even pointing out that Erick had recommended some players from the Inter B Team (U23’s) that might be suitable. Again Tiger asked for confidentiality but confirmed that Erick was actually engaged with a project he had committed to prior to joining Oxford and it prohibited him from working with the club until it had finished. We asked Tiger if we could meet him and he was happy to arrange that for April when Erick will be at his first home game. We also suggested that he should be introduced on the pitch at the game and Tiger agreed. When asked about Zaki and his closer involvement in the club Tiger suggested he would be in close contact with Niall but also would be more involved in the financial side of the club as per his background. Zaki is already involved more on a day to day basis as he lives within an hour of Oxford and we expect this involvement to continue and develop. We asked about the ongoing role that Horst Geicke and will chase answers up on that over the coming days/weeks. There was nothing more on the other directors but we believe the figures OxVox last produced on shareholdings remain accurate. We understand arbitration has now been completely halted, has an agreement been made on costs? Is Darryl Eales liable for any of the costs as he started proceedings? Was the HMRC issue in any way caused by the extra cost of arbitration or costs that had not been fully accounted for on purchase? As discussed before, arbitration has legal proceedings around it so we didn’t get any details on it but it was confirmed that arbitration had been halted and agreements had been reached on settlements and we await conformation that this process has been completed. Zaki has been very involved in these discussions and it is our understanding he has built a good working relationship with Firoz Kassam (FK) which should be seen as a positive for the club. Given the proposed settlement of arbitration, does the club favour renegotiating the lease at our current stadium or finding land to build a new stadium on? The club stressed they remain open to all solutions to this problem which is the position OxVox feel offers the best chance of moving us forward. 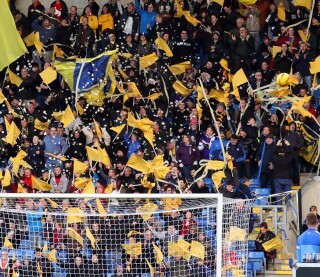 The club are in discussions with FK regarding various opportunities with the Kassam stadium but also continue to research potential sites for a new stadium. We have been made aware of all the sites under review and currently there are four being researched further as well as the Kassam stadium itself. Having reviewed some of the information and spoken to some of the planners involved all that we can say is that the sites are all sensible starting points and all have merits but that this process is long and extremely complex and we will continue to monitor progress and report back. Given the nature of property deals and planning we agreed with the club that we would continue to keep the sites confidential. Is the club currently looking at any sites outside of Oxfordshire and is there any truth to the rumours that we are looking at sites in Bicester? Niall was very open about where the options were. While the exact location of the sites are confidential it is fair to say that most would be considered ‘sensible’ locations and all are ‘Oxford’ sites. We have been assured that Bicester is not an option being looked at. Having finished the main body of questions we then went on to talk about funding, the January window and various other projects around the club. We asked if the issue with Singha beer had been sorted and while we believe it is not signed off yet, we understand that agreement may be imminent. We spoke to Tiger about being more open and communicative and we agreed to ‘host’ an open day when the training ground was fully finished. We discussed plans to give around 20 members the chance to be taken around the training ground and watch a full session and meet the players. We will be on hand to help with the tour but Tiger will host it and take members and fans around the facility. Plans are well under way for the new kit and Tiger was staying an extra day to complete the signing of Mark Sykes. Tiger assured us there was money for the right players but obviously buying strikers in January is not easy but that he hoped to bring in two to bolster the team which could mean a loan deal. Tiger was acutely aware that the last transfer window had left some unfinished business and accepted his part in that and is determined to provide the club with better going forward. We also pressed Niall on the information flow from the club and improving our communication and he suggested a full ‘interview’ at the training ground. We will speak this week to arrange a time and he has promised to try and put a little more substance to the clubs plans going forward. He was firm with his answer when telling us there would be ‘no more HMRC issues’. After the meeting had finished we caught up with Michael Doyle, the stadium manager at the Kassam, and during the discussion we asked him if he could chase Firoz Kassam to meet OxVox so that we could discuss stadium issues going forward. We now have a meeting pencilled in for January which we hope to confirm soon. We feel it’s important to have a relationship with all the major stakeholders connected to Oxford Utd and will report back when we have spoken to him. Finally we would say that Tiger and Niall were very generous with their time and gave us over an hour of very focused discussion, and while OxVox remain vigilant and will continue to hold the club to account on all these issues, we were grateful for the open nature of the discussions. While we cannot verify everything we are told by the club and continue to investigate where we feel appropriate, we felt the answers given were sincere and were a step forward for the club in their communication with the fans. On a personal note I would just like to say I am proud to step up to cover the role as chairman and while I sign my name after all communications it is on behalf of the whole committee that I do so. Now more than ever it is time to stand together, as a committee, as fans and as a club. Let’s get behind the club for the vital run of games and help drag them and us out of the mire and up the table.